A sales order in CraveInvoice is a order issued by a business enterprise to its customer. It can be for items/services. It is nothing but the PO of customer and SO of seller or customer order. To create or modify the Sales Order, go to Invoicing menu and click on "Sales Order" menu command. Create new record: Follow the steps to make Sales Order. 1. Order number and order date will be generated automatically.You can manually change the invoice date to something else if required. 2. Optionally select the sales quote details from the drop down list against which you are creating the sales order. Once you select the sales quote, automatically all the details will be displayed in sales order. 3. Optionally you can give your reference details for your preference. It can be the mode of communication done between the parties. 4. Optionally you can specify the delivery date. 5. Tax Description - Once you will need to select a tax structure(if applicable) from the drop down list as per the tax requirement for the sales order. Once you select it, tax rate will be displayed automatically along with calculation but you will need to specify rate and quantity before the tax is calculated. 6. Select the customer name from the drop down list. It's address will be fetched automatically from the customer master, you can change it here if you need to. 7. Optionally specify the contact person name. 8. Select the mode of transport from the transport drop down list. 9. Next step is to select one or more items. Click "Select item" button to select the items from the list. For each item, you need to click on "Select item" button. For each item, please specify the quantity to be quoted. Rate will be fetched from item master by default but you can change it if you needed. 10. Optionally you can specify the payment terms and delivery terms. This will be printed in sales order report for reference. 11. In calculation section, specify discount and shipping cost if applicable. Discount and shipping cost can be specified in percentage or value. 12. Optionally you can mention the additional details in the notes text box if required. 13. Verify all the details and click Save button. Once your data entry is complete, click Save button. Note: To know more about each data field on the Sales Order form, refer to the data fields section below in this topic. Modify the Sales Order : To modify a sales order record, go to all records tab and select a sales order record from the list that you wish to update. Click modify button. On the add/modify tab, you can now make the changes to the selected sales order record and click save button. Delete Sales Order : If the sales order is used in any transaction record such as sales invoice, then you will not be able to delete the sales order. Otherwise you can select the sales order to be deleted from all the records list tab and click Delete button. 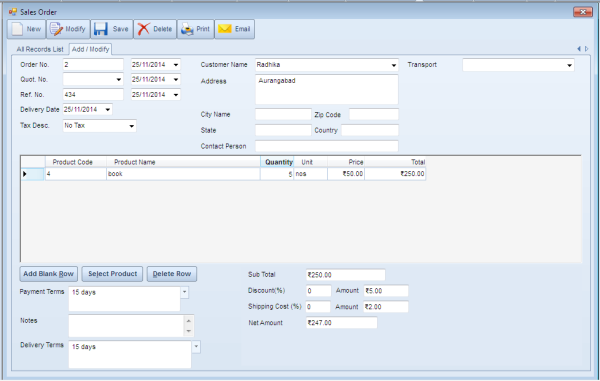 You can also select multiple sales order with the mouse by dragging it over the list or using Ctrl + left mouse. Once selected, click Delete button. Print Sales Order : When you save a record it will show a message "Do you want to print the order?" then you can click "Yes" if you want to print otherwise click "No". If you click "No" to print in the message then you can go to all records tab and select a record from the list that you wish to print. Click Print button. Email Sales Order : To email the sales order to customer, select the sales order record from the list that you wish to email. Click Email button. Add Blank Row: To add more items which is not present in master, you can click on Add blank row button to add the blank row and then you can type the item details. Delete Row: If you want to delete the row, you can select the row and click on Delete Row button. Copyright © 2011-2017 Reflection Software Solutions Pvt. Ltd.